"This timesaving guide addresses nearly every aspect of pollution control for the mining, production, transportation, and distribution of chemical fertilizers covering current and emerging technologies for all segments of the industry, including raw materials production, end products, and by-products." Part 1 Introduction: Growth of the World Fertilizer Industry; Pollutants, Wastes, and By-Products of the Industry; Regulation and Pollution Control in the Fertilizer Industry. Part 2 Nitrogen Fertilizer Industry: Ammonia Production; Ammonia Pollution Control Measures; Ammonia Storage, Loading and Transport; Nitric Acid Production; Impact of NO Abatement on the Fertilizer Industry; Ammonium Nitrate and Nitrochalk. Part 3 Phosphate Fertilizer Industry: Introduction to the Phosphate Fertilizer Industry; Phosphate Rock Storage, Transportation and Processing; Sulfuric Acid Production; Sulfuric Acid Storage and Transport; Impact of SO2 Abatement on the Fertilizer Industry; Phosphoric Acid by Wet Process - Recovery of Fluorine-Containing Gases; Phosphoric Acid by Wet Process - Phosphogypsum, Transport, Storage and Utilization. Part 4 Potassium Fertilizer Industry: Introduction to the Potassium Fertilizer Industry; Environmental Aspects in Mining and Production of KCl; Long-Term Solid Waste Management and KCl Facilities Decommissioning; Air Emissions at KCl Facilities. Part 5 Mixed Fertilizer Industry: MAP, DAP and NPK Fertilizers - Pollution Control Practices in Japan; MAP, DAP and NPK Fertilizers - Pollution Control Practices in the United States and Europe; Nitrophosphate-Based NPK Fertilizer - Air Pollution Control; Nitrophosphate-Based NPK Fertilizer - Wastewater Treatment. Part 6 Liquid Fertilizer Industry; Ammonium Phosphate Solutions and Suspensions; Hot and Cold Blend Liquid Fertilizer Plants; Containment Systems for Liquid Fertilizer Plants; Plant Site Remediation. "The editors have successfully brought together contributions from over 30 experts. . .to present an international overview of the subject. . .provides valuable reference information to the specialist and non-specialist alike. " 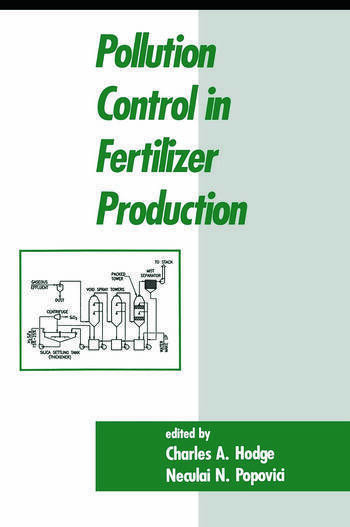 ". . .a useful volume on the environmental needs of the fertilizer industry. It is wide-ranging and should have a place in the libraries of fertilizer companies and research organisations. " ---Biofouling From the Foreword. . .
". . .Never has such a book been written from an environmental perspective. . . I commend this book to anyone associated with mining, production, and marketing of fertilizer--from the CEO to the plant operator and the environmentalist. All will benefit greatly from its insights. "